Memorial Day celebrations may have become more a time to fire up the grill than a time to remember our ancestors. Still, it is important to initiate family gatherings that have the express purpose to pass on the best that they left us. My parents, Arland and Fern Larsen, were both born in 1909. Both of them passed away before the momentous start of a new century. In 2009 my four siblings and I hosted a hundred-year birthday party and reunion for our parents’ posterity. Every family situation is different, and your own celebration might be very different from ours, but maybe our ideas will jump-start your own. For the event, we were able to reserve a cultural hall. As siblings, we planned the program together and all of us contributed memorabilia for displays. That evening when we gathered to set up displays, our feeling of anticipation grew. It was so good to see Mom’s quilts and other handwork again. 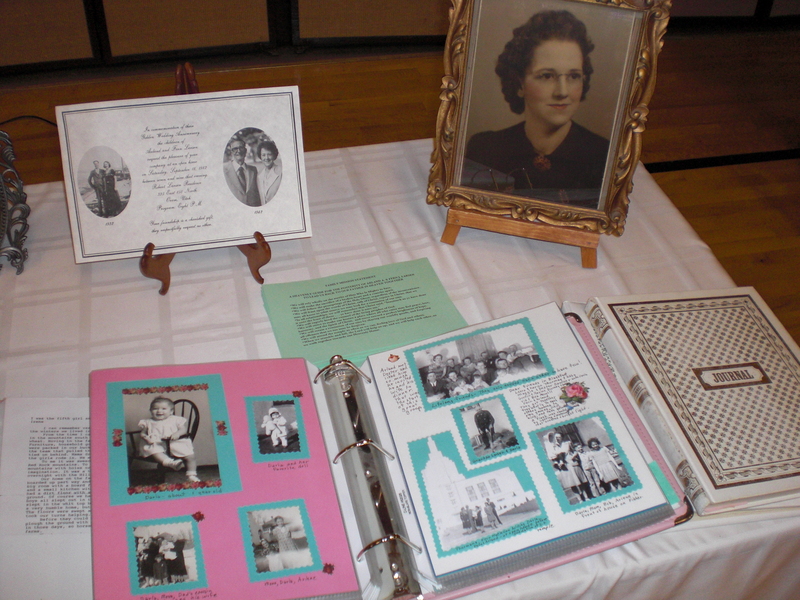 We displayed framed pictures (including a hundred-year-old picture of mom when she was a baby, memorabilia from Dad’s mission in Sweden, journals in their own handwriting, picture history books, certificates, and more. We labeled each item so the young people would know exactly what it was. To start the program we sang Happy Birthday to Grandma and Grandpa. On the big screen on the stage we projected an interview with our mother, Fern, videotaped when she was about 80. What a thrill! It was like having a personal visit with our Mom. (And it was a way for those who never knew her personally to get acquainted). Next, we viewed short segments of the family history video we had put together for Mom’s 85th family reunion birthday party. We gave a copy of the complete two-hour video, transferred to DVD, to each family and encouraged them to show and discuss it in segments in family home evenings. My sister Arlene read from a talk Mom had written in her own handwriting on the importance of studying the scriptures. To make the message more vivid to the children, we asked the 20 Primary-aged children to come up and sing the song Scripture Power. They all knew it and sung enthusiastically, and that impromptu song turned out to be a highlight of the program! Arlene also told about Mom’s special dresses that we had on display. Fern’s only best dress–an exquisite black silk from the early 30s— is still a wonder. Fern had also saved most of the dresses she wore at her children’s wedding receptions and the outfit she wore for her own 50th wedding anniversary celebration. At the end of the program two of the grandchildren sang the song they had sung for Mom and Dad’s senior mission farewell, “How Great Thou Art” which set the stage so beautifully for my closing remarks. I told of the Lord’s tender mercies to all of us at the time of her passing, including the story of Mom’s visitation by angels three weeks before she died. The angels told Fern they would come and get her in three weeks. Her countenance was radiant from that moment, the Spirit filled the house, and she died peacefully three weeks later—to the hour. I bore testimony of Mom and Dad’s love for their posterity and how much they are counting on us to support and love each other through the hard times. They knew how much families matter and want all of us to remember that. *We will rely wholly on the merits of Him Who Is Mighty to Save. *We will make the sacrifice of a broken heart and a contrite spirit. *We will follow the promptings of the Holy Ghost, regardless of the inconvenience. *We will feast upon the words of Christ, talk of Christ, rejoice in Christ, that we may all know to what source we may look for a remission of our sins. *We will eagerly heed the counsel of the living prophet of God. *We will strive to make our homes a place where all who enter may feel peace, love, harmony, and the Spirit of Christ, and move toward a perfect brightness of hope. *We will retain a remission of our sins by sharing our worldly goods, and forgiving all offenses that we too may be forgiven. *We will attend the temple as often as we can, feeling love of God and others. *When we stumble and fall, the Lord will help us up, and we will help each other, as we walk together towards our Heavenly Home. The event was memorable in every way. So many family members thanked us for our efforts and we felt happy and satisfied that our small efforts had resulted in an outpouring of the Spirit and an outpouring of love for our parents and for each other. How Can You Pass On Your Legacy of Faith? The legacy of faith so many of us have been blessed with is so worth celebrating! I encourage you to think of ways you could bring your own family closer by celebrating the legacy of goodly parents and grandparents. No one has perfect parents; ours certainly were not. But no matter their shortcomings, if our parents pointed us toward the gospel of Christ, we have been blessed indeed. Reminding each other and our posterity of such blessings is a worthy endeavor. Writer Christine Davidson, said, “Voices of our heritage may be buried somewhere in the dust of our neglect.” We can choose to raise those voices from the dust and find ways to let them ring loud and clear. Surely the Lord will show each of us small, do-able ways to keep the voices of our heritage ringing out in our own family. Memorial Day is a good time to start. Note: Visit Darla at her website darlaisackson.com. Darla, this is something I want to do--to pass to our posterity the legacy of faith.